Beautiful yet functional, corbels add classic architectural details to any home. 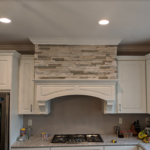 If you’re in need of artfully designed and skillfully crafted corbels and brackets for your kitchen and home projects, Turntech has the solutions. Corbels – What Are They? A corbel is a projection that juts out from a wall to provide support for a cabinet, countertop, shelf, or any type of structure above it. The earliest use of corbels dates back to pre-medieval Europe as they were used to support ceiling beams where they met interior walls. Later, particularly during the Renaissance, corbels and decorative brackets were used to support oversized balconies. Although corbels and brackets were first made of stone or concrete, wooden corbels and brackets began appearing in the Victorian Era. Much smaller and lighter than their stone counterparts, wood corbels quickly began appearing in homes for the first time. Today, corbels are used in homes and every type of building to provide structural support, elegance, and undeniable visual appeal. 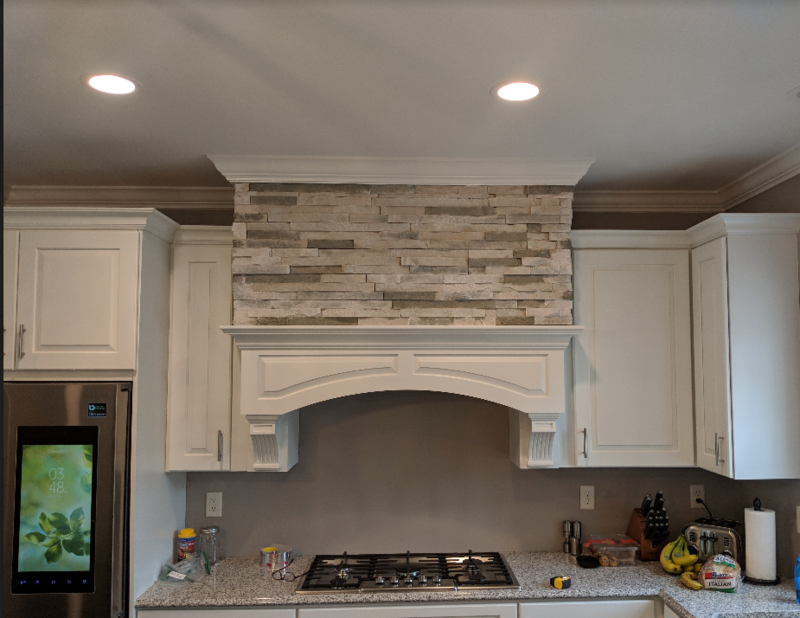 Serving contractors, homeowners, and kitchen cabinet shops around the country, we offer a wide-variety of wooden corbels and brackets. From wrought iron brackets to stainless steel brackets and wooden mission corbels, they are functional yet beautiful work of art your clients will love! 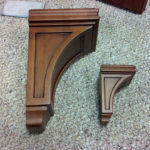 Our Corbels and Brackets typically ship in 1-3 business days, so you can have them stained or painted and ready for install in no time at all. Able to support over 200 pounds, our decorative corbels and brackets are the perfect kitchen addition. 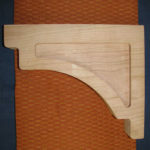 At Turntech, we specialize in turned wood products. However, we know our way around steel and wrought iron as well. That’s why we offer several varieties of beautiful yet highly functional wrought iron and stainless steel brackets for our clients to choose from. Plus, there are several types and sizes of corbels to choose from within each style! In addition to our skillfully crafted corbels, we also offer a wide-variety of wrought iron brackets. With 20 different styles to choose from and both thin and thick options available for each style, you have 40 beautiful and well-made brackets to choose from. 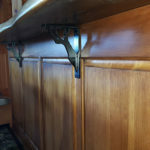 These elegant yet simple brackets are perfect for kitchen cabinets, shelving, bars, mantles, and more. A thoughtful inclusion of wrought iron brackets into your designs will add style, sophistication, and character to any cabinet work. Stainless steel brackets are the latest and greatest addition to our product line. 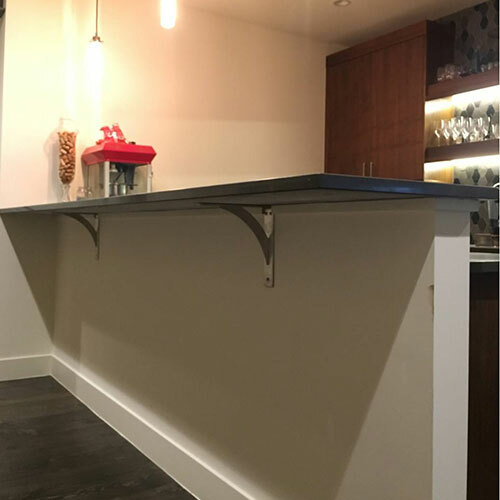 Heavy-duty and extremely durable, these contemporary high-quality brackets are ready to support any countertop, cabinet, or shelving. Since we believe in quality and making our client’s lives easier, all of our steel brackets also feature back welds for a clean look and come pre-drilled for easy installation. With six designs to choose from, they’re perfect for a simple, sleek, and modern look. Why Choose Turntech Corbels & Brackets? We specialize in premium wood products. Based in Lancaster, PA, our Pennsylvania Dutch craftsmen utilize generations of experience and cutting-edge CNC machinery to produce custom wood products that are second to none. However, when you choose us as your corbel and bracket supplier, you’ll quickly see our dedication to excellence extends beyond the shop and into the office as well. At Turntech, we understand the importance of our clients and strive to provide the products and personalized attention each deserves. Whether you need one corbel or a thousand, contact us to discuss your needs and place an order today!